Richard Moore with the Dalai Lama during a previous visit to the city. 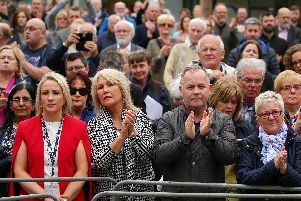 The Dalai Lama is set to return to Londonderry to celebrate the 20th anniversary of the Children In Crossfire charity. The Tibetan leader will visit the city on September 10 and will be guest of honour at a public event at the Millennium Forum. The Dalai Lama is a patron of the charity and a close friend of the its founder, Richard Moore. The public talk at the Millennium Forum will be entitled ‘Compassion in Action’, and will aim to encourage people to ‘be the change they want to see in the world’. A host of other well-known local and international speakers and entertainers will also feature in the event and will be announced in due course. The Dalai Lama has been to Londonderry several times before. In 2013 he walked across the Peace Bridge with Catholic and Protestant children and took part in a series of public engagements. Children in Crossfire is a local charity with an international programme, dedicated to saving and changing lives by promoting early childhood care and development in some of the poorest countries in the world. Since the charity was founded in 1996, it has raised over £25 million for worthy causes in 10 countries. These have included providing safe water to over one million people in Malawi; integrating over 500 visually impaired children into mainstream education in The Gambia; successfully supporting the treatment of over 2,000 children with cancer in Tanzania, and treating more than 10,000 children suffering with severe acute malnutrition in Ethiopia. Richard Moore, Director of Children in Crossfire, said: “I am delighted and honoured that Children in Crossfire’s Patron, His Holiness the Dalai Lama, has agreed to be the key note speaker at our 20th anniversary celebration to be held in the Millennium Forum. His message of compassion, forgiveness and peace is needed now more than ever. All of these values underpin the work of Children in Crossfire. “Children in Crossfire’s vision is to bring about a Compassionate World where every child can reach his or her potential. Tickets for the event on September 10 will be available through the Millennium Forum Box Office from Saturday, June 17. Further details of the visit will be announced in the coming weeks on www.childrenincrossfire.org.